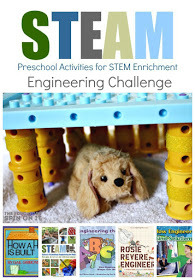 I loved this post on “The Educator’s Spin on It” which gave an idea for an engineering experiment to try with a preschool age child, and also included broader tips on how to build Engineer-Thinking skills in your child, book recommendations about engineering, and so on. But when I read it yesterday, I didn’t expect to try the experiment today! Then today, we had one hour before nap-time, and needed a new idea for an activity. My son asked for fizzy science experiments, and we played for a while with vinegar and baking soda. Then he asked for a new science experiment. I remembered the post, and said: “Let’s build a rain shelter.” We made a bunny-like object out of a paper towel and talked about how we could keep it dry. First, I asked my son how to keep dry, and his first idea was to wear a raincoat and rain pants. (He goes to an outdoor preschool in Seattle, so is well practiced in this method!) We put bunny in a ziploc bag (aka his raincoat – my son is not quite savvy enough to realize how bad a plan a ziploc would be if the bunny actually needed to breathe!). And then we ran bunny under the faucet. Sure enough the “raincoat” kept him dry. Then we took off the raincoat, and practiced having bunny hide under a flat roof. (The lid off a bistro box from Starbucks.) That worked for a little “rain” but when we had a lot of rain the flat roof spilled over. But the “roof” we were using had “gutters”, so we cut out a section and added a straw for a downspout. (Then we had lots of chances to sing the Itsy Bitsy Spider and talk about waterspouts.) We then folded the lid in half to see the advantage of peaked roofs over flat roofs. Then we made a “tree” out of shredded up plastic bag… that also shielded our bunny till there was just too much rain and the “ground” (the plate the bunny was on) got so wet there were big puddles that ran under the “tree” and soaked the bunny. After that we walked around our house and looked at our gutters and rainspouts. We tracked where the rain would flow out of the spout, down the driveway, out to the road and down the street to the storm drain, and talked about how it goes to the lake from there. We looked at the flat roofs and peaked roofs in the neighborhood. In the end, it was a fabulous hour of interactive discovery inspired by a blog post I read yesterday morning. I would have never thought of this project on my own, and am so glad that I get to benefit from the shared creativity of other educators and parents! This entry was posted in Play and Fun Activities, STEM activities and tagged engineer, play, preschool, toddler on October 18, 2014 by Janelle Durham. Tooo cute! (even though the poor bunny got soaked) Way to go for bringing more engineering into your day. Isn’t it great how such a simple activity can be so powerful and engaging? Thank you for sharing and I hope you are able to enjoy our other challenges as well! loved this experiment… will keep a note of it so we can do it when my little one is a little older!! !